The historic Championship Course was designed by legendary architect, Robert Trent Jones, Sr. Since opening in 1958, it has consistently ranked as one of the top public courses in the nation and has a deep, rich tradition of hosting some of golf's most prestigious tournaments; the most notable being the 1974 PGA Championship -one of golf's four majors. In a thrilling finish, Lee Trevino edged Jack Nicklaus by a single shot to take home the Wanamaker Trophy. Seasoned veteran, Sam Sneed, at the age of 62 finished tied for third. The United States Golf Association selected the Championship Course for the playing of the 1986 U.S. Amateur Public Links Championship. The best amateur golfers from around the country came to Tanglewood to try and win one of the most coveted amateur titles, which was won by future PGA Tour standout, Billy Mayfair. From 1987 to 2002, the top players on the Senior PGA Tour competed each fall in the Vantage Championship. Won by such notable names as Lee Trevino, Gary Player, Hale Irwin and Larry Nelson, it was the first "million dollar purse" on the Senior Tour and remained the richest prize purse for several years. Thanks to Jones's vision, each picturesque hole, built on gentle rolling hills surrounded by nature, is beautifully framed and guarded by many of the course’s 98 bunkers. Five sets of tees offer golfers of all abilities a fun, challenging and memorable day of golf on the storied fairways where the legends of golf have roamed. Come and see why the Championship Course was voted the #1 public course in the state by North Carolina Magazine! After playing, take in the stunning vista while relaxing on the clubhouse patio. The sunset is magnificent! The Reynolds course at Tanglewood, designed by legendary architect, Robert Trent Jones, Sr., is a shot-makers delight and has been a favorite of golfers for many years. Because of its design, this scenic Jones gem, with elevation changes from tee to green on many holes, is fun for golfers of all abilities. Multiple sets of tees, ranging in distance from 4611 to 6567 yards, gives everyone a chance to play well and have an enjoyable day. For the experienced player, accuracy and shot-shaping are required to score well. Many holes are doglegs which demand draws and fades from the back tees. The sloping, tree-lined fairways penalize errant tee shots. A well placed drive with a fairway wood or hybrid club is usually the best option and often leaves a mid to short iron second shot. Yet, with multiple risk and reward holes, players will constantly be tempted to challenge the course. If successful, they will be rewarded, but if not, the penalty can be severe. The eighteenth hole, a 411 yard par 4 is considered by many to be the most difficult hole at Tanglewood. A narrow, twisting, uphill fairway is guarded by a deep bunker left and woods right. A long, straight tee shot from the tips is a must in order to have a chance to hit the tiny, well protected, elevated green in two shots. Very few birdies are made here! Located in beautiful Tanglewood Park, come out and see why the Reynolds Course is recognized as one of the best values around! 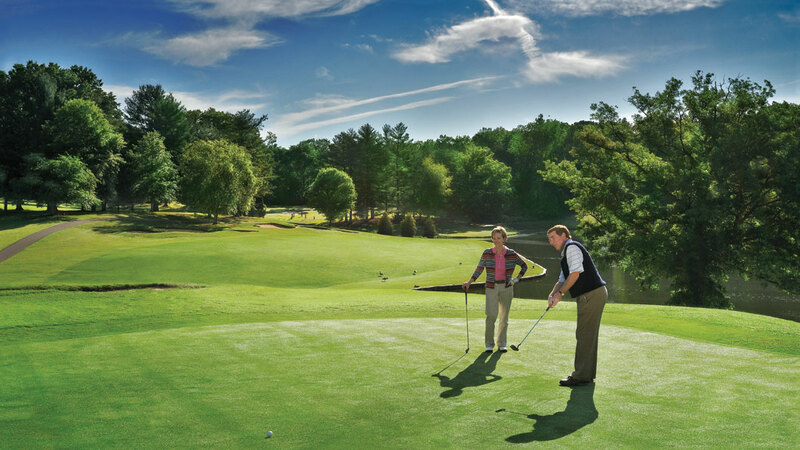 Tanglewood’s Par 3 facility features an 18-hole golf course and driving range. The par 54 golf course is great fun for golfers of all ages. The course is easy to walk-most holes are 100 yards or less- and can be played in two hours. It is an ideal place to spend the day with family and friends regardless of skill level. The all grass driving range is spacious and lighted. During the months of April through Labor Day it is open until 9:00 pm. In addition, there is a chipping green and bunker for short-game practice. Annual range memberships are available. 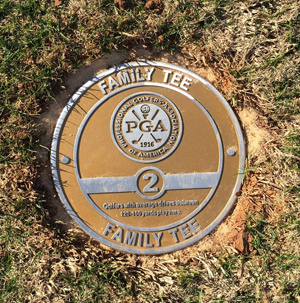 Tanglewood now has Family Tees on the Championship and Reynolds courses. They're perfect for juniors, beginners and for golfers looking to lower their scores and have more fun!